Bring a sense of harmony to your bathroom, with the attractive tapered look of this brassware range. A perfect union of form and function combines ease of use with eye-catching design. The Concealed Thermostatic Twin Shower Valve offers thermostatic showering via two easy-to-operate controls. Suitable for all types of plumbing installation this shower valve has the added safety benefit of a built in anti scald device should the cold water supply fail. Seperate controls for temperature and flow. Operates one shower accessory: fixed head or slide rail kit. 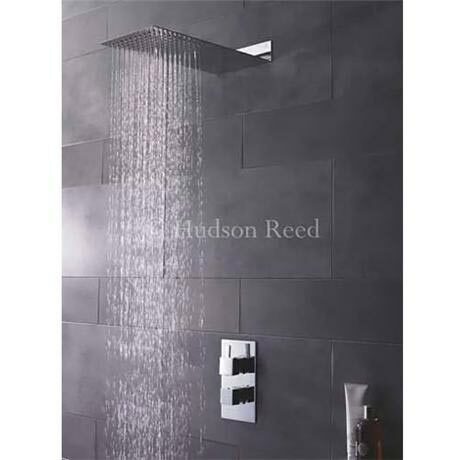 The Ultra Thin Fixed Shower Head from Hudson Reed. Adding a touch of class to any modern shower room, the ultra thin shower head is both stylish and promises exceptional quality. Minimum operating pressure of 0.5 bar is required for best perfomance. Brilliant design, with the concealed twin Shower valves and two easy-to-operate controls. The design is really great and super sleek and modern which is just what i was looking for. I choce it also because it has a safety benefit of a built in anti scald device, which is great as i have young chldren who also use this. Cheapest arround.